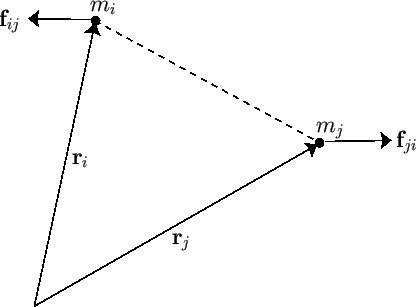 (See Figure 2.2.) One corollary of Newton's third law is that an object cannot exert a force on itself. Another corollary is that all forces in the universe have corresponding reactions. The only exceptions to this rule are the fictitious forces that arise in non-inertial reference frames (e.g., the centrifugal and Coriolis forces that appear in rotating reference frames--see Chapter 6). Fictitious forces do not generally possess reactions. 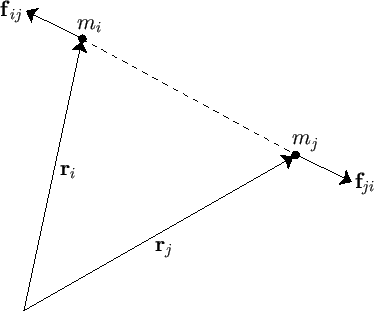 Figure 2.2: Newton's third law. Newton's third law implies action at a distance. In other words, if the force that object exerts on object suddenly changes then Newton's third law demands that there must be an immediate change in the force that object exerts on object . Moreover, this must be true irrespective of the distance between the two objects. However, we now know that Einstein's special theory of relativity forbids information from traveling through the universe faster than the velocity of light in vacuum (Rindler 1977). Hence, action at a distance is also forbidden. In other words, if the force that object exerts on object suddenly changes then there must be a time delay, which is at least as long as it takes a light ray to propagate between the two objects, before the force that object exerts on object can respond. Of course, this means that Newton's third law is not, strictly speaking, correct. However, as long as we restrict our investigations to the motions of dynamical systems over timescales that are long compared to the time required for light rays to traverse these systems, Newton's third law can be regarded as being approximately correct. According to Equation (2.26), the center of mass of the system moves uniformly in a straight line, in accordance with Newton's first law of motion, irrespective of the nature of the forces acting between the various components of the system. A comparison of Equations (2.28) and (2.29) suggests that is also a constant of the motion. In other words, the total momentum of the system is a conserved quantity, irrespective of the nature of the forces acting between the various components of the system. This result (which only holds if there is zero net external force acting on the system) is a direct consequence of Newton's third law of motion. In other words, the total angular momentum of the system is a conserved quantity, provided that the different components of the system interact via central forces (and there is zero net external torque acting on the system).